The next online online blog-comment information literacy Journal Club meeting takes place at 8-9 pm UK time on Wednesday 13th March 2013 (see http://tinyurl.com/chs7qu3 for times elsewhere - and note that this is one of those times of year when the difference between times in the UK and times in North America are different from usual, because we go over to summertime later than the USA/Canada!). 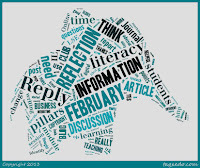 The topic will be A New Curriculum for Information Literacy (ANCIL). For those new to ANCIL, you may want to start with the Executive Summary, which is here: http://ccfil.pbworks.com/f/Executive_summary.pdf. As before, the real-time discussion will take place in comments to a blog post on the journal club website during the hour mentioned above. During that time the authors of ANCIL, Jane Secker and her colleagues, will be present and helping Niamh Tumelty and me facilitate discussion. People are also very welcome to add comments and questions before and after this real-time event. There is more information on the Journal Club website here: http://infolitjournalclub.blogspot.co.uk/2013/02/online-journal-club-13-march-ancil.html - that is where the blog-comment discussion will take place. Illustration: Tagxedo of the previous blog post discussion. Secker named as Mover and Shaker!